SpaceTech provides technical consultation, systems design, planning, implementation, installation, testing and operation of television & broadcast studio, terrestrial & satellite transmission facilities as well as of telecommunications & IPTV solutions. Our background in television broadcast engineering and telecommunication business and our partnership with international specialized manufacturers and suppliers allow for a unique approach to each project where we utilize our experience, creativity & reliability to meet customers' specific requirements. 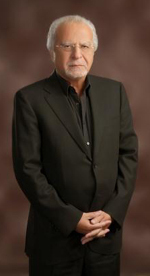 Obtained his PhD in Television Engineering in 1978. He worked at Jordan Radio & TV (JRTV) as Director of Planning, Projects & Studies from 1979 till middle of 1995, when he joined Arab Radio & TV (ART) as Director General of Engineering till January 1st 2005, when he established "SpaceTech TV Engineering" , providing technical consultation & turn-key projects in the fields of radio, television and satellite broadcasting & communications. In the years 2014 – 2015 , Dr. Lubbadeh acted as the Managing Director of ATG Broadcast Middle East , international broadcast system integrator, part of the Dan Technologies Group, located in Dubai UAE & Amman Jordan. During his work at JRTV, Dr. Lubbadeh was responsible for planning & execution of a wide range of projects for establishing & upgrading radio & television studios and developing terrestrial & satellite coverage. At ART, he established the digital transmission centre in Italy & the production studios in Egypt, Saudi & Jordan, and was responsible for the establishment of a server based totally automated playout centre & satellite teleport at Jordan Media City. He also provided technical consultation for a number of broadcasters including Rotana Television Network, Al-Ghad TV station and Sout Al-Madina Radio station. Dr. Lubbadeh published a number of refereed papers in different scientific reviews and authored different technical papers at IBC, ITS, Broadcast Asia, DVB & CabSat Dubai conferences. He participated in the activities of EBU, ASBU & ABU , and was selected as a member of the IBC Council since 1998. SpaceTech TV Engineering has been awarded of Jordan Radio & Television (JRTV) Purchase Order for the design, supply, installation, commissioning & training of the upgrade of TV Studio No 17 to High Definition. This is the second similar project awarded to SpaceTech in the last year, as the main News Studio No 1 upgrade to HD is being implemented . This session, organized in cooperation with ASBU, provided an insight into current trends & future perspectives of broadcasting & digital media in the MENA region. The implementation in different MENA countries of new technologies like HDTV & beyond ; digital terrestrial ; OTTv ; mobile, internet & cloud solutions for media distribution ; and of I.P in production , was introduced. Report of a research in 20+ MENA countries on “the state of convergence and how broadcasters are embracing the digital media” was released, and top-line results and highlights from the survey conducted , was shared at the session. Other topics addressed at the session included the fragmentation of the media scene in the MENA region and the roles of new media players, in particular the telecom operators; advertising in the MENA region & the move towards targeted advertisements; cloud technologies and highlights of Al-Jazeera cloud strategy , execution and benefits; and the issue of spectrum allocation between telcos and broadcasters. 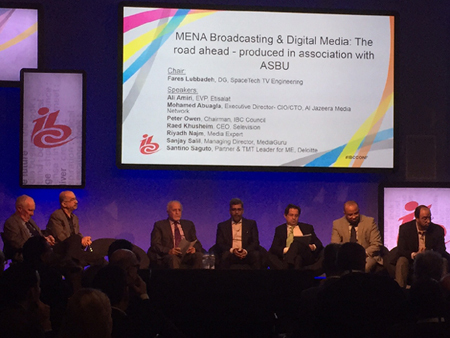 On Sunday 15th of September 2013 at IBC 2013, Dr. Fares Lubbadeh chaired the MENA session on "Broadcasting and ICT in the MENA countries" and presented the following introduction. MENA - The Growing Market on the Developments of Broadcast and Telecom Markets in the Arab World. Dr. Fares Lubbadeh published this article on "Future & Perspectives of Television in the Arab World" in the international magazine "AV Specialist Middle East & North Africa", Volume 20 , August 2007.